On any list of the most beautiful countries on Earth, you can always expect to find New Zealand near the top spot. Made especially famous in the recent cinematic retellings of Tolkien tales The Lord of the Rings and The Hobbit, the amazing landscapes of New Zealand have inspired and amazed generations of people for many years and stand out as some of the finest examples of Mother Nature's beauty anywhere on the planet. It's no surprise, therefore, that New Zealand is a very desirable and popular vacation destination, with many people flocking to this island country from all over the globe to admire its amazing scenery and postcard-style landscapes. If you're planning on visiting New Zealand, you'll need to decide whether to check out the North Island or the South Island first. These two islands are separated by the Cook Strait, with the North Island being home to over 75% of the country's population and some of its biggest cities like Auckland and Wellington, but the South Island also having many advantages of its own. The South Island, also known as Te Waipounamu, is actually the bigger of the two islands. It enjoys a temperate climate, with some very warm temperatures and plenty of sunshine throughout the summer months in particular, and is the 12th biggest island on Earth. There are around 1.1 million people living on the South Island, with these New Zealand residents typically being nicknamed 'Mainlanders', due to the fact that the South Island is the larger of the two main islands. Some of the top things to see and do on the South Island of New Zealand include visiting Mt Cook, which is the highest peak in the whole country, stopping off at Stewart Island to meet some kiwis and kaka, exploring natural areas like Fiordland National Park and the Marlborough Sounds, and relaxing on the bays and beaches of Abel Tasman National Park. You’ll also find some super places to stay all around the South Island, with hostels being a great option here for those who wish to keep their travel costs down and save money for other uses. Read on to learn more. Located in a wonderful spot in the town of Wanaka, the YHA Wanaka Backpackers is one of the top hostels on the South Island of New Zealand. The Puzzling World mazes and illusion rooms are only a short journey away from this hostel, with Lake Wanaka and the Deep Canyon touristic hotspots also nearby too. In short, there's a lot to do in the local area, including lots of nice scenic walking trails and breathtaking New Zealand scenery to see and admire. Guests can choose between private rooms and dorms at the YHA Wanaka Backpackers. The dorms are available in both mixed-gender and female-only format, so this is the sort of hostel where you can really choose a room type that suits you and feel totally safe and comfortable from the first minute of your stay to the last. Other amenities at this South Island hostel include free Wi-Fi, a huge communal kitchen, clean bathrooms, a reading area, pool table, dining tables, and lounge space. Another amazing hostel location on the South Island of New Zealand is the YHA Queenstown Lakefront Backpackers. As the name implies, this hostel is located right on the banks of a lake in the beautiful location of Queenstown. The lake in question is Lake Wakatipu, and the local attractions include a casino, visitor center, gardens, shops, restaurants, and the beautiful Ben Lomond Scenic Reserve, so there are a lot of different adventures to be had and experiences to be enjoyed in this part of New Zealand. The YHA Queenstown Lakefront Backpackers offers a mixture of private rooms and dorms, all decorated and furnished to a very high standard. This hostel doesn't settle for second best, so you'll really be blown away by both the comfort and the cleanliness of this particular location. Guests who choose to stay here will also be able to check out the clean bathrooms, shared kitchen, cozy lounge spaces, free Wi-Fi service, and laundromat. If you're going to the South Island of New Zealand, you simply can't miss out on a trip to Mount Cook. It's the tallest mountain in the whole country and is a truly impressive sight to behold, with lots of other snowy peaks and beautiful forests all around the local area. The YHA Aoraki Mt Cook Backpackers is one of the top hostels to choose for trips to this part of the South Island as it's actually located within Mt Cook National Park. The YHA Aoraki Mt Cook Backpackers is just a short walk away from the Mueller Glacier and quite close by to Tasman Lake too, so there's lots of good recreation opportunities and scenic landscapes to be seen nearby. 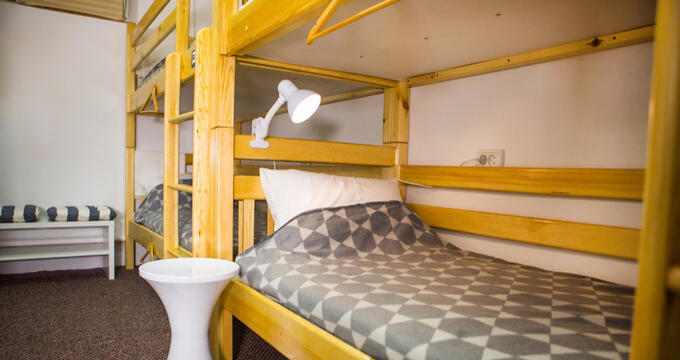 There's a rustic lodge-style theme permeating through this New Zealand hostel, so the rooms and dorms are all nicely decorated with warm wooden walls and furnishings, creating a very cozy atmosphere. It's a very welcoming place to spend a few nights and it comes equipped with a sauna, dining area, shared kitchen, optional breakfast for a small fee, free Wi-Fi, and lounge area.